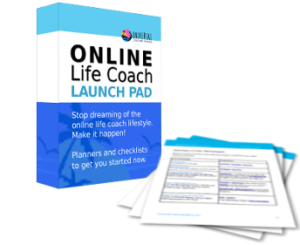 What is the Online Life Coach: Launch Pad? The Online Life Coach: Launch Pad is a free toolkit of 8 templates that helps coaches start the big move online. The Launch Pad helps you stay grounded and focused on what matters most in those early days. If you have been dreaming of having the online life coach lifestyle – where you can: live and work from anywhere, work on your own terms to your own schedule, break from sourcing clients locally and tap into the global market place and generate passive income. BUT you don’t know where to start, the Online Life Coach: Launch Pad is for you. 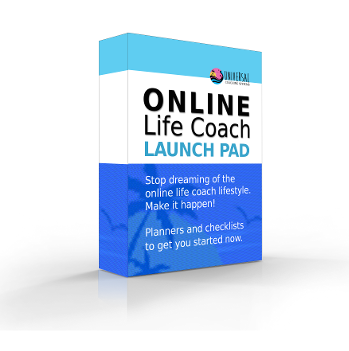 The Online Life Coach: Launch Pad has the essential planning tools you need to stop dreaming of the online life coach lifestyle and start making it happen. Coaching Business Vision Planner – Fill this out and keep it updated to always stay focused and true to your brand essence. Coaching Product Planner – Map out some smart coaching products to sell in your coaching business. Build your own passive income stream. Website Homepage Checklist – Make sure your homepage covers the critical points for online coaching business success. Marketing Planner – get your head around some simple marketing you can do for your online coaching business in the next 6 months. Client On-boarding Process Planner – Make sure every new online coaching client consistently gets an awesome, welcoming experience when he/she signs up with you. Online Course Planner – Stop teaching the same lessons over and over in your coaching sessions. Let clients learn in their own time and spend their sacred one-on-one time with you moving to even higher levels. Online Resource Library Planner– Decide which resources you’d like clients be able to access online. 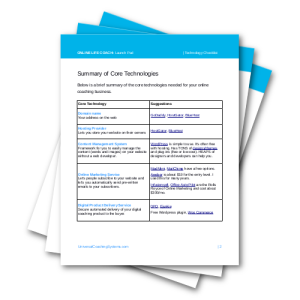 Technology Checklist – don’t let new technologies distract you. Stay focused on the core must-have tools. Once these are in place and you have free time, then play with new ones. Get attention from the right prospects. Plan out your own coaching products. Give your online clients tremendous value from day one. Invest in the right technologies to get the job done.